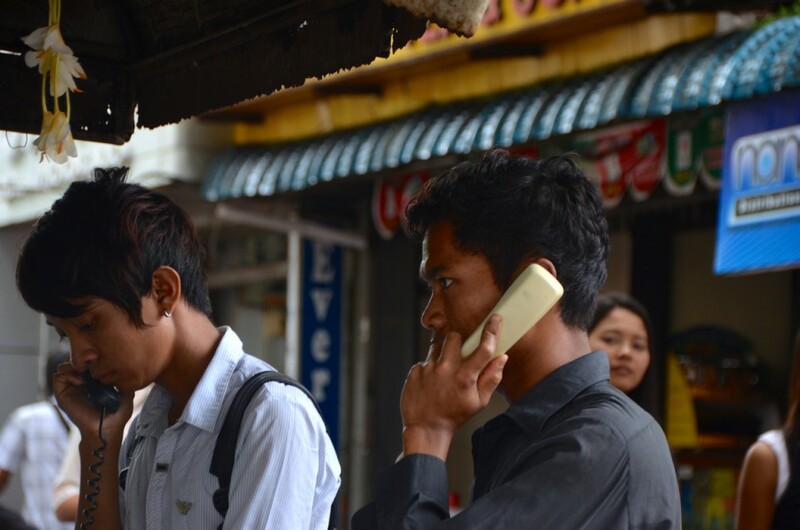 YANGON — Japan’s KDDI and Sumitomo and their local partner Myanma Posts & Telecommunications are raising the stakes in an intensifying competition for Myanmar’s nascent mobile communications market. In a sign of the joint venture’s determination to dominate the recently liberalized market, state-owned MPT in early September launched the first batch of 5 million $1.50 3G mobile SIM cards that it plans to sell this year. The release of the cards created minor havoc in Yangon’s downtown shopping district and elsewhere, drawing long queues and, in some cases, police intervention at phone shops across the country. Sumitomo, one of Japan’s top three trading houses, said it was “very confident” that the joint venture would “maintain the leading position” in Myanmar mobile communications, in spite of growing competition from other operators. A company spokesman said his comments represented the shared view of the three partners. Sumitomo and KDDI, Japan’s second-largest cellular operator, said they will plough $2 billion into MPT over the next decade under the partnership deal, which was announced in July. However, Qatar’s Ooredoo also launched services in late July, and Norway’s Telenor is due to start operations by the end of September. MPT was Myanmar’s sole telecommunications provider until mid-2013. For years under the former military regime, tight government controls on communications led to stratospheric prices for SIM cards, which at their peak were selling for $3,000 to even $5,000. Since the reformist regime of President Thein Sein came to power in early 2011, prices have plunged. By late 2013, a 3G or data-enabled SIM card cost around $200, still high in a country where teachers earn $116 per month and per capita gross domestic product barely exceeds $1,000 a year. 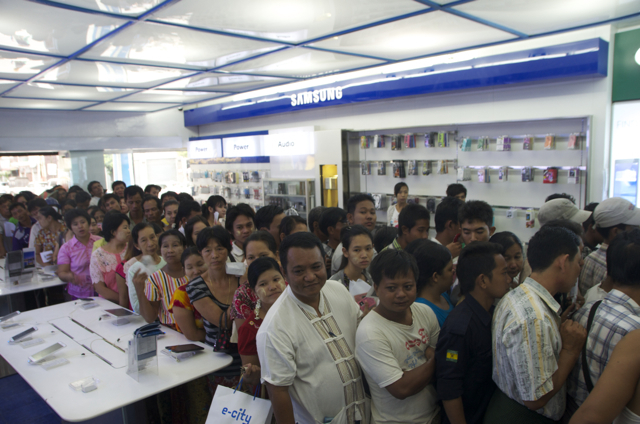 Unsurprisingly, only about 1 million of Myanmar’s 51 million people owned mobile phones in 2011. The market began to change in June 2013, when Myanmar awarded two hotly contested operating licenses to Telenor and Ooredoo, two months after MPT substantially lowered prices for non-data SIMs. The liberalized market has resulted in an almost ten-fold jump in subscriptions, with an estimated 10 million people now using mobile phones. Ooredoo said it has signed up 1 million subscribers, while Telenor said its short-term target is to roll out services in Myanmar’s three main cities before expanding into the regions. “Our long term commitment is to provide 90% of the country with affordable and accessible mobile communications within five years of the launch,” Telenor Myanmar CEO Petter Furberg told the Nikkei Asian Review. Ooredoo is selling airtime in cheaper blocks than MPT — a sales pitch that should appeal to the developing country’s poorer customers. “People buying Ooredoo top-ups usually buy just 1,000 kyat ($1),” said Toe Nwe Nwe Aung, who operates a small kiosk near Yangon’s St Mary’s Cathedral. She said she sells 10 to 15 such top-ups a day over the rusted orange counter at her street side shop front. MPT appears to have an even bigger lead in sales of more costly top-ups. “We usually sell six or seven 5,000 kyat MPT top-ups, and three or four 10,000 kyat top-ups,” said Toe Nwe Nwe Aung, predicting that MPT’s cheap data SIM offerings will draw more subscribers than both foreign providers, at least for now. This view is shared by James Ko, Myanmar country manager for the e-City chain of mobile phone shops. “People’s general preference is for MPT, which is understandable given their long-standing presence,” said Ko, who had to lock the doors of the e-City outlet on Yangon’s Mahabandoola Road on the day MPT started selling cheap data SIM cards after selling out his stock in an hour. As network prices fall, ordinary people will benefit from the cheaper communications that have become a staple of life in neighboring countries. According to calculations by McKinsey, Bangladesh, Cambodia, Laos and Vietnam all achieved 70% mobile penetration rates in 2011, the year Myanmar began to open up under the current government. The sales mania shows no sign of dissipating. Outside the Z phone shop on Pansodan Street, a wide boulevard dotted with faded colonial-era facades in downtown Yangon, 47-year-old Myo Lwin was among a lunchtime crowd of around 100 people waiting to buy SIM cards. Despite the early hour, the shop was shuttered — with a sign informing would-be customers that more SIM cards should be available the following day. Myanmar’s government says it wants to quadruple the country’s GDP by 2030, and lift millions of Myanmar people out of poverty — a dramatic change in tone from the opaque, oppressive military junta that restricted lucrative sectors of the economy to a narrow elite until the country began to liberalize in 2011. Sean Turnell, a Myanmar expert and an economist at Australia’s Macquarie University, also believes widespread access to mobile communications could transform the country’s economy. “In terms of economic impact, this increased connectivity can make production and distribution more efficient, and it can allow better access to markets and market information,” he said. Citing mobile phone-based success such as the M-Pesa simplified money transfer system used in Kenya and other developing countries, Turnell suggested that Myanmar could “leapfrog” older ways of doing business using mobile technology. “The old brick-and-mortar banking model can be bypassed,” he noted. First, however, Myanmar’s poor infrastructure must be modernized. Roads are often poor, and only about three in 10 people have access to electricity — mostly in urban areas, according to government figures. Acquiring permission for building can also be a problem, although Telenor’s Furberg said government help was available to cut through local red tape. Telenor Myanmar cited several such issues on its website in August, including one where monks sought payment for land they claimed was owned by their monastery. The standoff prompted a “legal process with lawyers and local authorities to establish the landowner as the rightful owner — not the monastery,” according to Telenor. Alongside those land disputes, the Norwegian group faces a host of “normal operational challenges, as you would expect,” Furberg added.